Freac 1.0.32 Portable » TopFreeSoft.Net - Best Freeware Software! 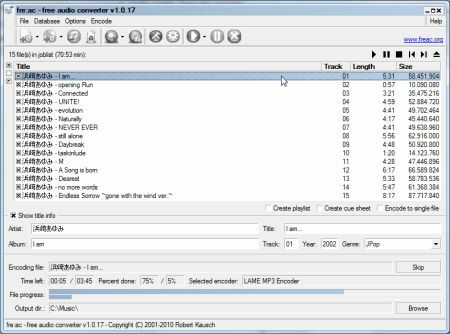 Fre:ac (formerly BonkEnc) is a free audio converter and CD ripper with support for various popular formats and encoders. It currently converts between MP3, MP4/M4A, WMA, Ogg Vorbis, FLAC, AAC, WAV and Bonk formats. With fre:ac you easily rip your audio CDs to MP3 or WMA files for use with your hardware player or convert files that do not play with other audio software. You can even convert whole music libraries retaining the folder and filename structure. The integrated CD ripper supports the CDDB/freedb online CD database. It will automatically query song information and write it to ID3v2 or other title information tags. CDDB query dialog appearing off screen when main window is minimized.